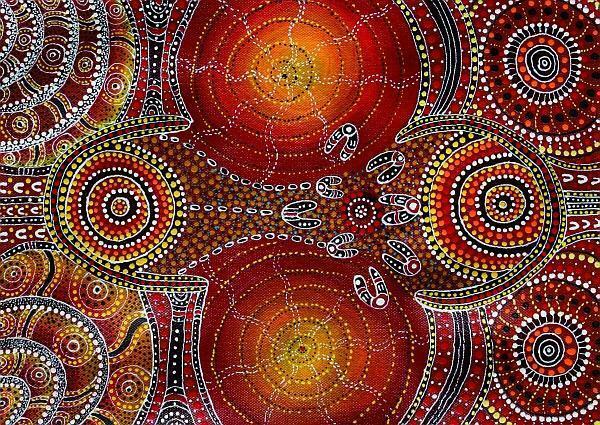 created by Aboriginal artist Ms Kathleen Wallace. Kathleen was born and raised at Uyetye, on the Todd River – her father’s homeland. Her mother is from Therirrerte. Her grandfather taught her stories of her culture and land from an early age. She now interpret stories for her audience. Here, she tells us a traditional story of ‘Two Women Learning’, which illustrates how different people hold different knowledge, different parts of the story, and how they are responsible for keeping that story safe and passing on the knowledge. Two young girls were taken from their mother by their father, to live in his homeland. They lived and learned their father’s way. But when they grew up, the two girls decided to leave their father’s home and look for their mother and her people. The father supported their decision, and so the girls started to walk. The girls eventually found their way to their mother’s homeland. They had come to the right place: their mother was very happy to be able to see them again, all grown up. One day, the father decided to follow his daughters and came to the mother’s land. The family were happy to be united, and other families were happy for them. They decided to stay there so the girls could learn new skills.